While the number of Americans who were raised in homes where parents had different religions appears to be growing, relatively few think of themselves as having been brought up in more than one religion, and even fewer say they currently belong to multiple religions. Roughly one-in-five American adults say they were raised by two people with different religious identities – such as a mother who was a Catholic and a father who was a Protestant, or a mother who was Jewish and a stepfather who was religiously unaffiliated – according to the newest report on our Religious Landscape Study. 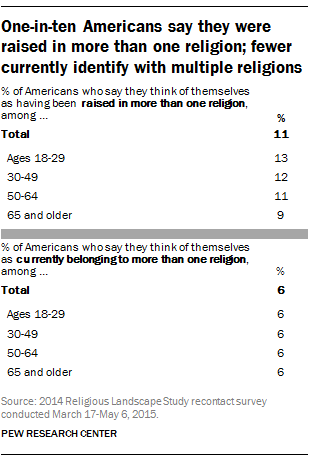 But only about half as many (11%) say they think of themselves as having been raised in more than one religion. And just 6% say they now identify with multiple religions. Young U.S. adults are considerably more likely than older Americans to report having been raised by two people with different religions. But this trend so far has not produced a discernible increase in the number of Americans who hold multiple religious identities. Adults ages 18 to 29 are no more likely than older adults to say they think of themselves as having been brought up in more than one religion. And there is no difference across age groups in the share who say they think of themselves as currently belonging to multiple religions. People who say they think of themselves as having been raised in more than one religion are more likely than others to identify with multiple religions as an adult. But still, only 15% of those who say they were raised in multiple religions now say they belong to more than one religion. The standard religious affiliation question on Pew Research Center surveys does not explicitly ask respondents whether they belong to multiple faiths. In the latest study, however, we deliberately set out to explore how much religious mixing takes place in American families and whether it is on the rise. So we asked respondents a series of questions about the religion of the main people who raised them (including, in some cases, not just parents but also step-parents, grandparents, foster parents, etc.). We also asked all respondents, explicitly, whether they think of themselves as having been raised in more than one religion, or if they now belong to more than one religion. If they said yes to either question, we posed an open-ended follow-up question, asking them to explain further. Among the survey respondents who say they think of themselves as having been raised in multiple faiths, nearly half (49% of this group, about 6% of all U.S. adults) say this means they were exposed to more than one religion, often through family members of different backgrounds. An additional three-in-ten (28%) say it means they practiced multiple faiths at one time, including by attending multiple houses of worship or observing holidays or other elements of more than one religion, such as celebrating both Christmas and Hanukkah. 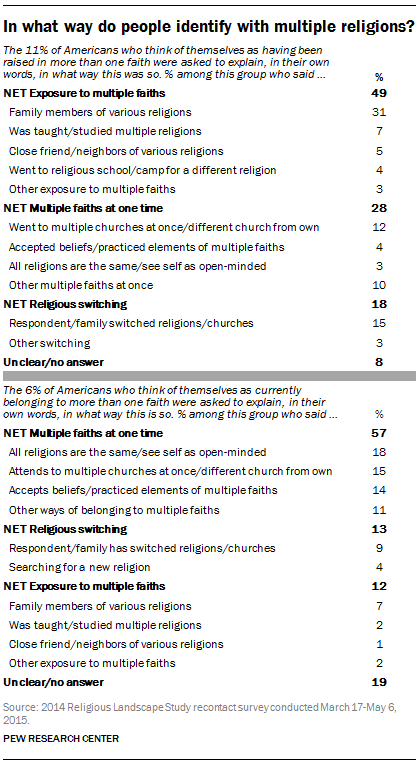 A smaller share (18%) say their family switched religions or churches, practicing first one faith, then another. A large share of the 6% of U.S. adults who say they currently think of themselves as belonging to more than one faith (57% of this group, or about 3% of all U.S. adults) explain that they actually practice or believe in multiple faiths at the same time. Specific explanations people in this category give include taking the view that all religions are essentially the same and attending different kinds of houses of worship. Fewer say their blended religious identity is due to changing religions or churches or to having family members of different religions.